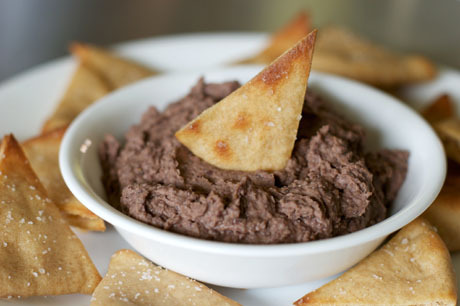 I came up with this easy black bean dip and whole wheat pita chip recipe when I remembered how much my mom and sister and I loved to snack on Trader Joe’s fat-free Spicy Black Bean dip back in the 90’s. If you’re looking for a quick and healthy snack that doesn’t taste quick or healthy, this is easy black bean dip is for you. With just a few simple ingredients, you can whip up this restaurant-quality appetizer. Black beans, one of the world’s healthiest foods, are packed with heart-healthy fiber and cancer-fighting antioxidants. The best part is that when combined with a whole grain like these whole wheat pita chips, beans provide a high quality protein. Filled with complex carbohydrates and protein, this is a snack that won’t let you down after an hour or two! This is one of those recipes that I just threw together from ingredients I had on hand. This means you can do the same. If you don’t have black beans, use whatever canned beans you have in your pantry! Same goes for the spices. Experiment with flavors you like, and if you come up with something great, don’t forget to leave a comment so the rest of us can try it too. Whole wheat pita bread should be pretty easy to find at most grocery stores these days. I like to buy a couple packages of whole wheat pita and keep it in the freezer. If you can’t find it at your local store, don’t worry. I’ll be posting a recipe for the homemade pita soon. 4. Serve with pita chips, corn chips, or your favorite crackers. 2. Using a basting brush, lightly coat both sides of pita with olive oil. 3. If using whole pita, cut each round in half then cut each half into four triangles. You should end up with 16 pieces. 4. Line a baking sheet with parchment (optional but makes clean up a breeze) then spread pita pieces out in a single layer. Sprinkle lightly with coarse salt. Turn pieces over and sprinkle the other sides lightly with salt. 5. Place baking sheet in oven and set timer for 5 minutes. Bake pita until the edges are brown and crisp, checking the first time at five minutes and then watching closely. Total baking time will be less than 10 minutes. 6. Remove from oven and let cool for a few minutes before serving. 7. Serve with your favorite dip. Nice... I like pita bread to dip in nice sauces. Ciao. Yum! I love dips and I especially love pita chips. One of my favorite "healthy dips" -- because we can't eat French Onion Dip everyday -- is an Ellie Krieger recipe for Roasted Red Pepper Dip: http://www.foodnetwork.com/food/recipes/recipe/0,,FOOD_9936_33407,00.html?rsrc=searchLately I've been buying mini pita rounds at Whole Foods, those are just as delicious and convenient as the pita chips and they come in white and whole wheat. Great idea Nicole! I make black beans dip but little different. I have never use onion and garlic powder wonder how it tastes?? Deborah: My husband is gone too. Although I made the black bean dip the other day, I had something similar to this for dinner tonight ;-)Orchidea: Me too :-)Erin: Thanks for link! I just checked it out and it sounds really great. I love almonds but have never thought of doing something like that with them! In a perfect world, I would eat Ruffles and onion dip all the time ;-)Padmaja: What do you put in your dip? Is it on your web site? So yummy. And I know you're not on a diet, but did you know this is perfect for the South Beach Diet? Both of these would be considered "good carbs." Why did I miss this? This sounds yummy and some different to offer as a nibble to guests...I still like corn chips! I love black beans because you can do so much with them. Ironically enough I just posted a recipe for my version of a dip. I used smoky BBQ sauce and it was wonderful! Kalyn: I don't know everything about the South Beach Diet but I figured this type of thing would probably fit pretty well with it.Peter: I love corn chips too! I just happened to have some leftover pita that was getting stale!Kitarra: I always have black beans on hand! You're right, you can do so much with them! We eat black beans and rice as a side dish quite often but I also throw them into all kinds of things! Thanks! It's delicious! Though I completely *burned* the first batch of pita chips in 3½ minutes in the oven... The second batch was perfect after about 2 minutes! This is awesome. Perfect to pack with some salsa and guac for lunch. Cooked sweets all day for Thanksgiving and had cooked a big pot of beans for a black bean fudge. SICK OF THE SWEETS ALREADY so I came across this recipe and within 10 minutes, made it and LOVE IT! Perfect for protein with great flavor!! YAY!! Reading your blog, I've been inspired; trying new things! I made this dip and chips tonight...love it!!!! Thank you!! !